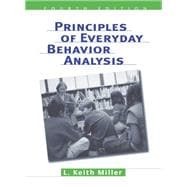 PRINCIPLES OF EVERYDAY BEHAVIOR ANALYSIS uses generalization programming to show you how to apply behavioral concepts to complex everyday situations. The author introduces, defines, and illustrates each behavior modification concept and then immediately includes vignettes that show you how to apply concepts to the real world. Does the Behavioral Definition Make Sense? What Behaviors Can Be Reinforced? When Is a Procedure Punishment? Who Decides What Is Undesirable Behavior?